Founded by one of Apple’s best-known former CEOs, Misfit arrived on the scene years ago with a stripped-down vision for wearables: affordable coin-sized activity trackers housed in plastic wristbands. Following its acquisition by Fossil, the brand is now chasing relevance in a market led by the Apple Watch, which explains today’s official announcement of the Vapor 2 — a $250 Wear OS smartwatch powered by Qualcomm’s prior-generation Snapdragon Wear 2100. Debuting just after Montblanc’s $995 Summit 2, the first Snapdragon Wear 3100-based smartwatch, Vapor 2 has the comparatively basic look and feel one might expect for a quarter of the price. Now offered in 41mm and 46mm versions, it includes a round 1.2-inch or 1.4-inch 328PPI AMOLED touchscreen with the company’s signature minimalist iconography. This time, a standalone GPS is included, rather than requiring a smartphone for location tracking, and NFC is built in for Google Pay payments. Misfit also says it has redesigned the heart rate tracker. Since Vapor 2 uses Qualcomm’s Snapdragon Wear 2100, you won’t get the speed or battery improvements promised by the newer 3100, but you will get access to the newest version of Google’s Wear OS. That means Google Assistant will be at the ready, along with the latest heart rate monitor-assisted health and activity tracking features. 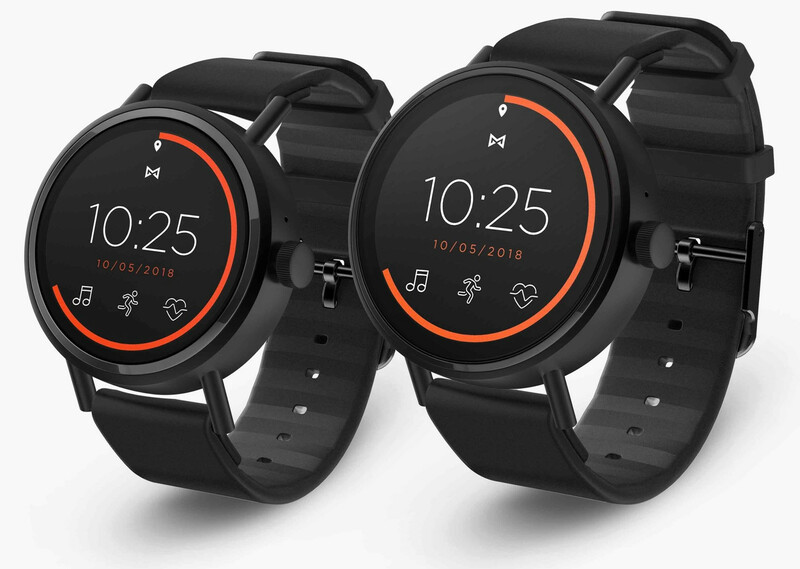 Misfit is promising “all-day” battery life from either a 300mAh (41mm) or 330mAh (46mm) cell. Vapor 2’s feature set puts it in roughly the same category as today’s entry-level Apple Watch Series 3, though it’s not quite Apple’s match. Equipped with 4GB of storage, it has its own music player with support for Bluetooth headphones, delivers Android or iOS notifications with haptic feedback, and recharges with a magnetic puck. It also promises 30-meter water resistance, enough for swimming in shallow water. All this comes at a price $50 higher than the original Vapor. Misfit says it will be available soon at a starting price of $250, which will be the same regardless of the size you prefer. Versions with stainless steel bands will sell for a modest $20 premium. With a base price that’s $29 to $59 less than the Apple Watch Series 3, Misfit could carve out a niche for itself as a “good enough” alternative.